In the summer of 2010-2011 Western Australia experienced an unprecedented marine heat wave that elevated water temperatures 2-4°C above average for more than 2 months. The heat wave resulted in defoliation of the dominant Amphibolis antarctica seagrass species across the iconic Shark Bay World Heritage Site. Researchers from the Institute of Environmental Science and Technology of the Universitat Autònoma de Barcelona (ICTA-UAB), in collaboration with scientists from Australia, Spain, Malaysia, the United States and the Kingdom of Saudi Arabia, alert us of the major carbon dioxide (CO2) emissions resulting from this loss of seagrass meadows at Shark Bay — one of the largest remaining seagrass ecosystems on Earth. Over the three years following the event, the loss of seagrass released up to nine million metric tons of carbon dioxide (CO2) into the atmosphere. This amount is roughly the equivalent to the annual CO2 output of 800,000 homes, two average coal-fired power plants, or 1,600,000 cars driven for 12 months. It also potentially raised Australia's annual estimate of national land-use change CO2 emissions by up to 21%. The ICTA-UAB and Edith Cowan University (ECU)-led international research, recently published in Nature Climate Change, has estimated that Shark Bay has the largest carbon stores reported for a seagrass ecosystem, containing up to 1.3% of the total carbon stored in seagrass soils worldwide. Collaborating researchers from the Department of Biodiversity, Conservation and Attractions of Western Australia mapped 78% of the Marine Park area within the UNESCO World Heritage Site in 2014 and found a 22% loss of seagrass habitat as compared to the 2002 baseline. If extrapolated to the entire Shark Bay's seagrass extent, this is equivalent to a loss of about 1,000 km2 of meadows. "Yet the widespread losses in the summer of 2010/11 were unprecedented. The net loss of seagrass extent was accompanied by a dramatic decline in seagrass cover. What remained was sparser, with 'dense' seagrass areas declining from 72% in 2002 to 46% in 2014", explains Ariane Arias-Ortiz, PhD candidate at ICTA-UAB and first author of the work. 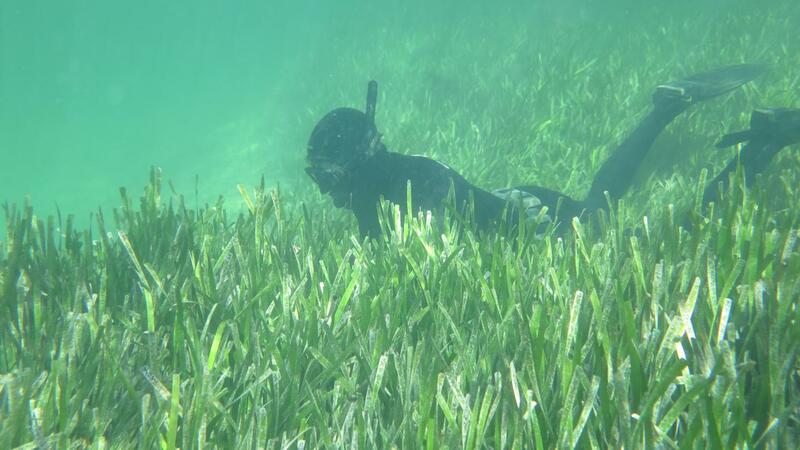 "This is significant, as seagrass meadows are CO2 sinks, known as 'Blue Carbon ecosystems'. They take up and store carbon dioxide in their soils and biomass through biosequestration. The carbon that is locked in the soils is potentially there for millennia if seagrass ecosystems remain intact", explains Professor Pere Masqué, co-author of the study and researcher at ICTA-UAB and the UAB Department of Physics. Dr Oscar Serrano, ECU researcher and also a co-author adds "so when you have an event such as the losses at Shark Bay, you not only lose the seagrass as a way of removing CO2, but the sequestered carbon is released back into the atmosphere as CO2 during seagrass matter decomposition". "Although seagrass meadows are amenable to restoration, more importantly, we should be looking at avoided loss of the seagrass carbon stores, because CO2 emission from degraded seagrass ecosystems greatly surpasses the annual sequestration capacity of healthy meadows", Ariane Arias-Ortiz explains. "With climate change forecast to increase the frequency of extreme weather events, the permanence of these carbon stores is compromised, further stressing the importance of reducing green-house gas emissions, and implementing management actions to avoid adverse feedbacks on the climate system", she says. To conduct the study, researchers used in situ sampling from 50 sites and soil modelling to make their calculations of potential CO2 release. While the Shark Bay Marine Reserves Management Plan 1996-2006 offers protections against local threats such as over-fishing and nutrient inputs from industry, agriculture and tourism, there is currently nothing in place to deal with global threats such as marine heat waves. "We need to advance our understanding of how seagrass ecosystems, especially those living close to their thermal tolerance, will respond to global change threats, both direct and through interactive effects with local pressures", said Professor Paul Lavery, ECU researcher and also a co-author. "We have seen how quickly losses can occur, and once destroyed, the capacity of seagrass meadows to recover is limited and slow, and largely depends on the arrival of seeds or seedlings", he adds. Plans for future catastrophes may include removing seagrass detritus to prevent phytoplankton and bacterial blooms which consume oxygen and reduce light reaching the seagrasses. Seagrass restoration is also an alternative and its effectiveness is presently being tested by Professor Kendrick from the University of Western Australia and co-author of the study.